On 7th July 2017, Hazrat Khalifatul-Masih V (May Allāh be his Helper) delivered the Friday Sermon at Baitul Futūh Mosque, London. Huzoor (May Allāh be his Helper) said: As we observe in the history of prophets, they face opposition after their claim. The fire of opposition and jealousy increases as their community grows. As prophets are sent by Allah the Almighty and He gives them glad tidings ofvictory, opposition never becomes a hindrance in the way to their success. When Allah the Almighty sent Promised Messiah(as) as the Messiah and Mahdi, he too was to be treated in accordance with this practice [of God]. Allah the Almighty informed him beforehand about various forms opposition and the miserable end of the opponents. God also informed him about the progress of his Community in the face of opposition. Huzoor (May Allāh be his Helper) narrated some faith inspiring incidences in this regard. Huzoor (May Allāh be his Helper) said that these incidences on the one hand, became a means of increasing the faith for Ahmadis and, on the other hand, became signs of the truthfulness of Ahmadiyyat for others. Nazir Da’wat IlAllah [Director of Preaching] at Qadian wrote that one of his mu’allim’s [preacher’s] went to his village before Ramadan to inform his relatives of the timings of Ramadan. A non-Ahmadi young man by the name of Iqbal came to the relative’s house. 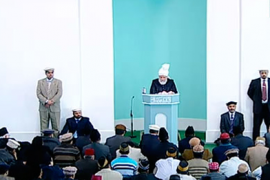 Mu’allim sahib introduced himself saying that ‘I am a mu’allim of the Ahmadiyya Community’. Upon [hearing] that, the person became furious with anger. The man became disrespectful and abusive towards Promised Messiah(as) and ahmadiyyat. Mu’allim sahib said that, we have been taught to reply with prayers in response to abuse. The man warned him that, ‘if you’re seen in this village ever again then you will face an evil end.’ The mu’allim sahib said that only time will tell who will face an evil end. Later, Maulvi Iqbal, who had verbally abused the Jama’at, suddenly died of heart attack. This incident, not only increased the faith of the members of the Jama’at in that tiny village but also greatly influenced the non-Ahmadis as they saw this support of Allah the Almighty for the Promised Messiah(as) . The missionary sahib of Ivory Coast writes that he went with a local missionary to a village to do Tabligh and informed them about the advent of the Promised Messiah and Mahdi. Initially fifteen people accepted Ahmadiyyat, including the village Imam. Despite opposition, community progressed. Then the non-Ahmadi Maulvies went to the local king. The king called local jamaat president sahib and told him to leave Ahmadiyyat or he will expel ahmadies from the land. The Sadr sahib replied that we would leave the village but we will never leave Ahmadiyyat. Then the king had a change of heart and told him that you do not have to leave the village and do as you please. The missionary sahib of Benin writes that we do Tabligh [preaching] through a radio program on a weekly basis. The director of this radio channel started opposing us. The works of God are such that he was fired due to allegations of corruption. We invited the newly appointed director to the mission house and he was informed about the teachings of Islam and Ahmadiyyat. Then after some time this new director said he will allow us to have another weekly programme free of charge. Ahmad Sahib from Egypt says that he performed Istikhara prayer and saw the house of the Promised Messiah(as) i.e. Dar-ul-Masih in his dream. Meaning that the other sects of Islam will continue to exist, however, God Willing, it is the Ahmadiyya Community that will reign supreme. Which means that he will grant the believers a reward according to the level of their sincerity.